IN A SEEMINGLY defiant move, Turkey’s Fox TV anchor went on air despite the sanction imposed against him by the Radio and Television Supreme Council (RTUK). 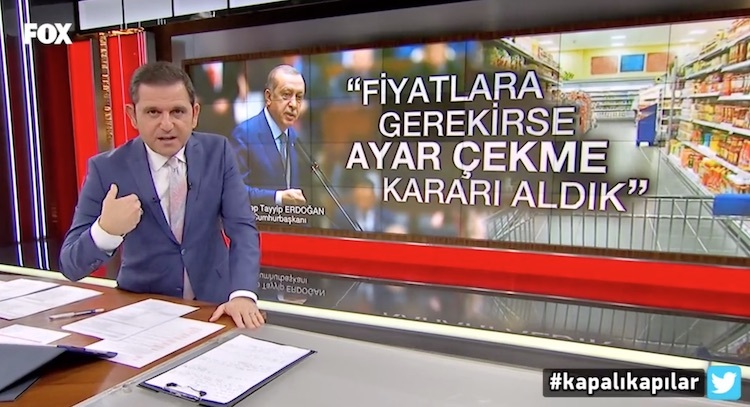 The authority had ruled against Fatih Portakal, the most watched anchor in Turkey, after he speculated on-air whether Turkish citizens will follow suit and protest like the Yellow Vest movement in France. Following this, Portakal was suspended from the 4-6 February from air by the authority. But he, defiantly, appeared on air. Opposing to RTUK’s ruling, FOX TV went to court to contest the ruling, where the court ruled against the watchdog and stop the suspension of FOX TV news bulletin. Following RTUK’s fine, it was expected that FOX TV would broadcast the documentary instead of the main news bulletin, but Portakal surprised many people as he appeared on his program at 19:00 pm yesterday and today, as it was secured by the court order. A Turkish prosecutor on 28 December launched an investigation into Portakal for “openly inciting others to commit a crime.” This was less than two weeks after Erdogan’s criticism, as Turkish dailiesHurriyet and Milliyet reported.